MAINTENANCE AND REPAIR for Mercedes, BMW, Audi, Volkswagen, Porsche, Saab, Volvo, Jaguar, Range-Rover, MINI, etc. Air Conditioning test/repair as well as refill and retrofit. European automobile maintenance and repair demands trained technicians and Eurowa staff continually upgrade their skills to meet the requirements demanded by modern automobile. 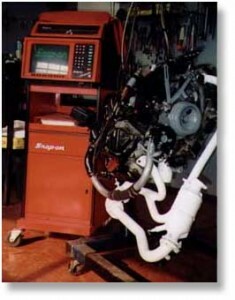 We use sophisticated electronic equipment to diagnose the computerized systems in contemporary vehicles, yet can also apply years of knowledge for working on classics. Modern vehicles are now built in many countries sharing common parts, and though specialized on German automobiles, we also service other high-end marques such as Range Rover, Jaguar, Volvo, Saab, providing a cost effective alternative to dealerships. We even service some Asian and American vehicles. Our customers are important, and we guarantee your complete satisfaction.